If you’re working your way down this list, by now your cup is dry and you still have many more stops to go. 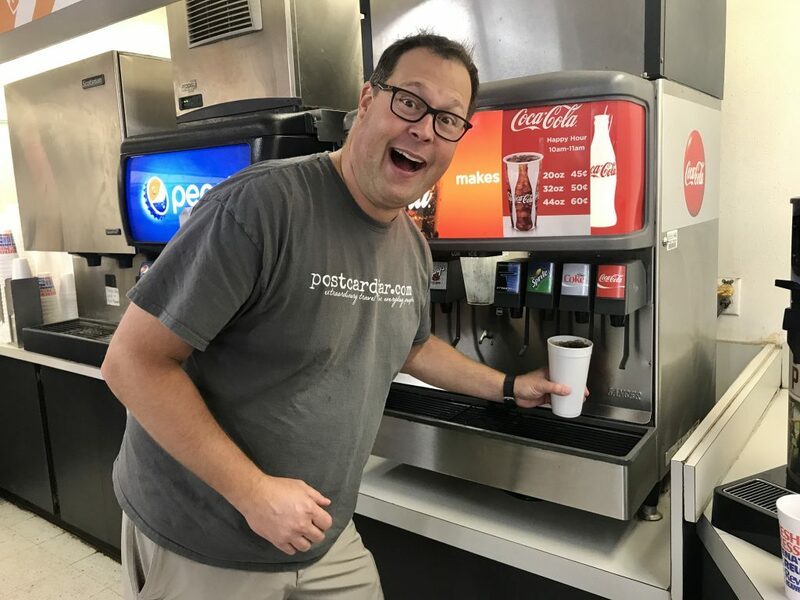 Remember that at Handy’s, refills are discounted, so take your cup in, get more of that wonderfully crunchy ice, and head on back out into friendly Pawhuska. Steve finishes refilling his cup with a cool, refreshing, pellet-ice laden Diet Coke at Handy’s. Located about 15 miles from Pawhuska, the 1,100 acre Osage Hills State Park offers many outdoor recreation opportunities like camping, hiking, fall foliage viewing, and fishing for bass, crappie, catfish, and perch. In the park, there are sites for tent camping, and RV parking. There are also eight cabins available for rent. With a pool, ballfield, and tennis court, this park has something for everyone. Head on out, you never know, you just might spot a whitetail deer or a wild turkey! The Osage News is a monthly publication that is sent across the country that, along with a website, keep people up-to-date on what’s happening with the Osage Nation. 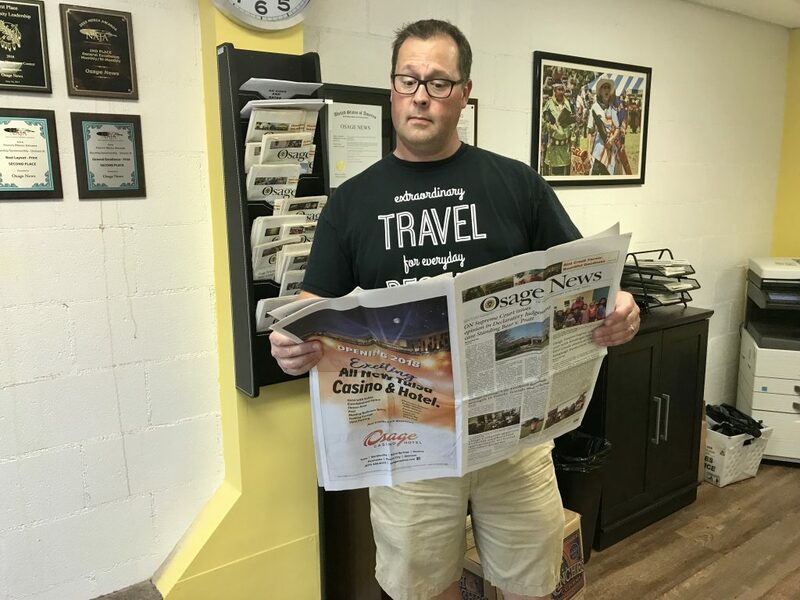 If you’re in Pawhuska, reading the paper is a great way to catch up on all the important news and events that are affecting the Osage. There is also the Pawhuska Journal-Capital, which includes local and area news, sports, and a “Happening Now” section on its website with a weekly calendar of events. Read the paper and catch up on the news. On July 4th, Pawhuska residents line the streets for a non-motorized parade to celebrate America. Participants march down the street while spectators enjoy free hot dogs, apple cobbler and water. Prizes for funniest entry, best wheels, best pet, best family, most original, most patriotic, and most outrageous entry are awarded. Or a hot hamburger platter. Locals told us that the breakfast burrito at Buffalo Joe’s Restaurant is to die for. They tell us that if you go, you need to make sure you add lots of fresh salsa. We took our moms there for lunch and all of us had great meals. Ann had the street taco daily special with spicy jalapeño salsa. 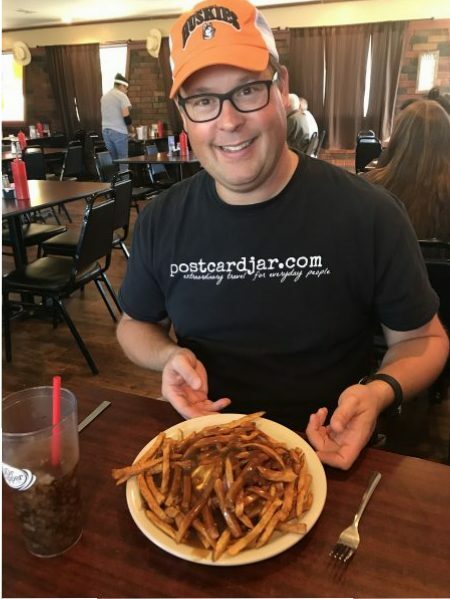 Steve loved the Hot Hamburger served open face with fries on top then covered in brown gravy. You can also get sandwiches and salads, so there’s typically something for everyone. There is an open faced cheeseburger under this pile of fries and brown gravy from Buffalo Joe’s. Pawhuska has more than a dozen churches that love to welcome visitors and several are listed on this Chamber of Commerce directory. It’s always good to slow down a bit and appreciate pretty things in life. One great place to do that in Pawhuska is Tallgrass Prairie Flowers and More. A unique store just down the block from The Mercantile on Main Street, it is not only a florist, but also a boutique that has candles, reed diffusers, snack baskets, fruit baskets and even barbecue buckets. Bath products for sale at Tallgrass Prairie Flowers and More. Home to the late, famed bronze artist John D. Free Sr., Pawhuska also plays home to his Bronze Horse Foundry. 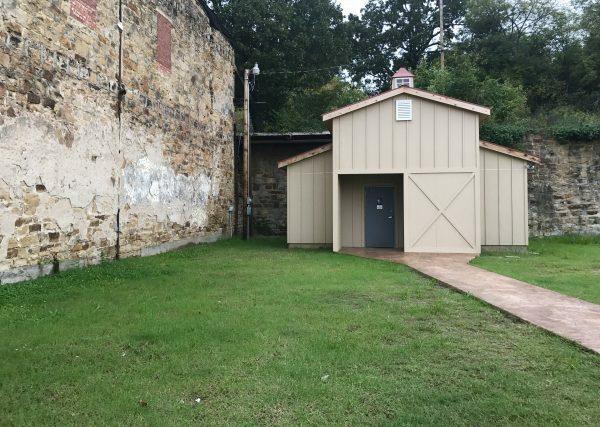 Located in Pawhuska at what used to the Armory, the foundary completes work for bronze projects all over the country. 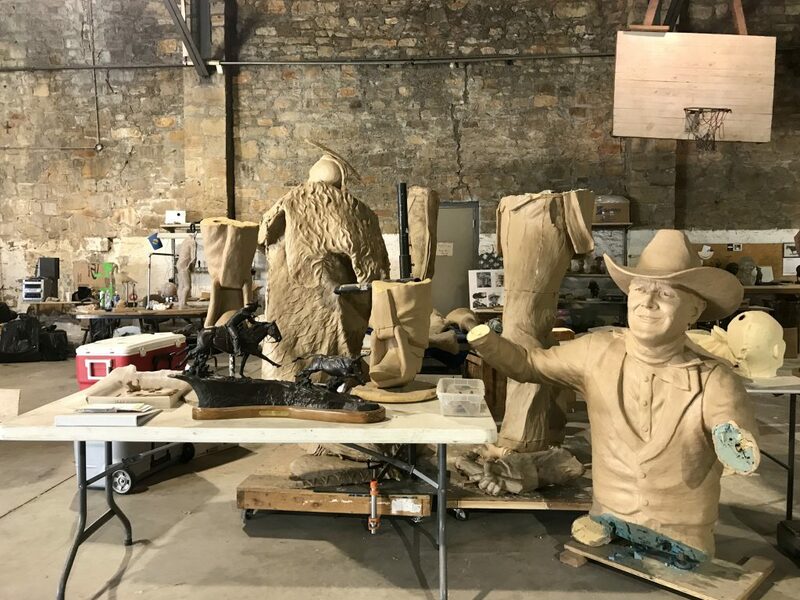 While not open to visitors on a regular basis, limited tours are available by appointment during which you can learn the fascinating process of creating bronze statues. For more information or to schedule a tour, call Cindy Free at (918) 287-4433. A sculpture of Ben Johnson Jr. is taking shape at the Bronze Horse Foundry. Each year, town residents and visitors line up alongside the street to watch the Christmas Parade of Lights. The parade features floats covered in Christmas lights and always includes a very special guest: Santa Claus. Grab a cup of hot chocolate and head on down to this unique local celebration that brings on the holiday cheer! The parade takes place annually on the first Saturday in December. Bluestem Lake near Pawhuska is a beautiful reservoir just a few miles out of town. The lake offers swimming and boating as well as cliffs with waterfalls to jump from during the hot Oklahoma summer months. We’re told that the cliffs are quite popular with teenagers in the summer. Spend a day relaxing on the water at Lake Bluestem. CV’s Family foods may also be known as Pawhuska Hometown Foods and/or Pawhuska Cash Saver. We like to call it the store where Ree might get a loaf of bread, or a gallon of milk. Located at 236 E. Main, and featured on The Pioneer Woman cooking show, it is your one-stop shop for all things grocery in Pawhuska. They also sell Pawhuska Huskies ballcaps and t-shirts have a full service flower shop and even a deli with hot foods. 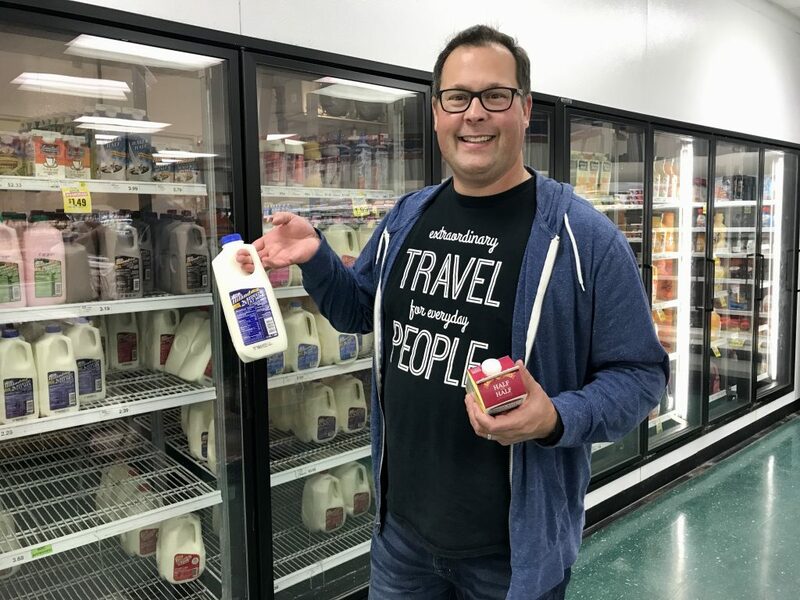 CV’s Family Foods is a great place to pick up a few things, especially if you’re staying at a B&B in town. Yes, we put this on all the lists we write about what to do when you’ve traveled somewhere. Send a postcard to your friends or family or mail one home for your own Postcard Jar like we do. Of course, we’d love for you to send us a postcard, as well. Send it to Postcard Jar, PO Box 334, Crete, NE 68333. 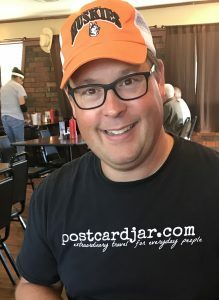 Mail your postcard at the Pawhuska Post Office. The cemeteries in and around Pawhuska are quite historic and worth a visit. The Pawhuska City Cemetery in town is where Oscar-winning actor Ben Johnson Jr. is buried. The local cemetery also has unique grave markers and mausoleums. 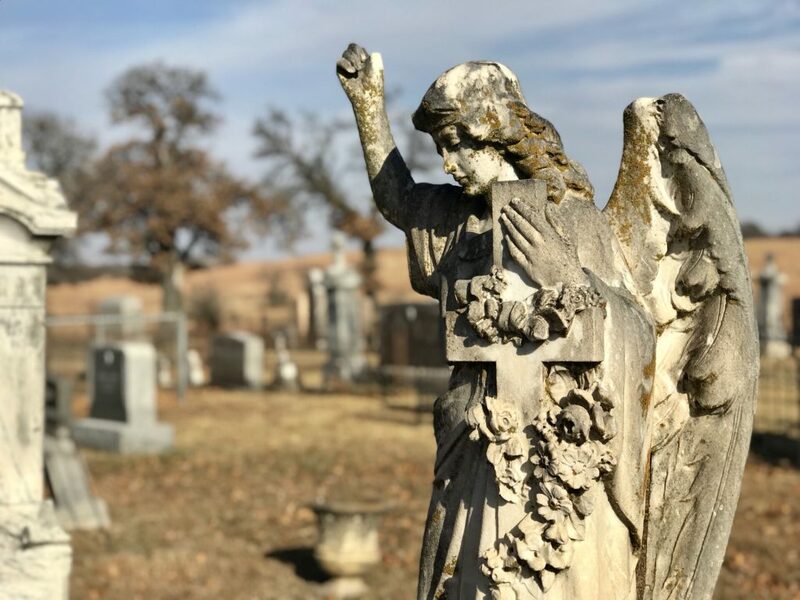 The cemetery in Gray Horse is actually located about 25 miles from Pawhuska but is key to understanding the history of the area. In his book, Killers of the Flower Moon, author David Grann tells the chilling story of the Osage murders. After oil was discovered, U.S. law said that only Osages or their legal heirs could receive payments for the oil leases on Osage land. Some white men then took advantage of that law, marrying into Osage families before murdering family members so they could inherit. The Gray Horse cemetery is where many of these murder victims were laid to rest. Read the book to learn more about this case and the FBI investigation into these horrific events. The cemetery at Gray Horse. At Weigant’s Pharmacy, in addition to being a place to fill prescriptions, they have a large selection of medallions and other religious items pertaining to the Catholic faith. 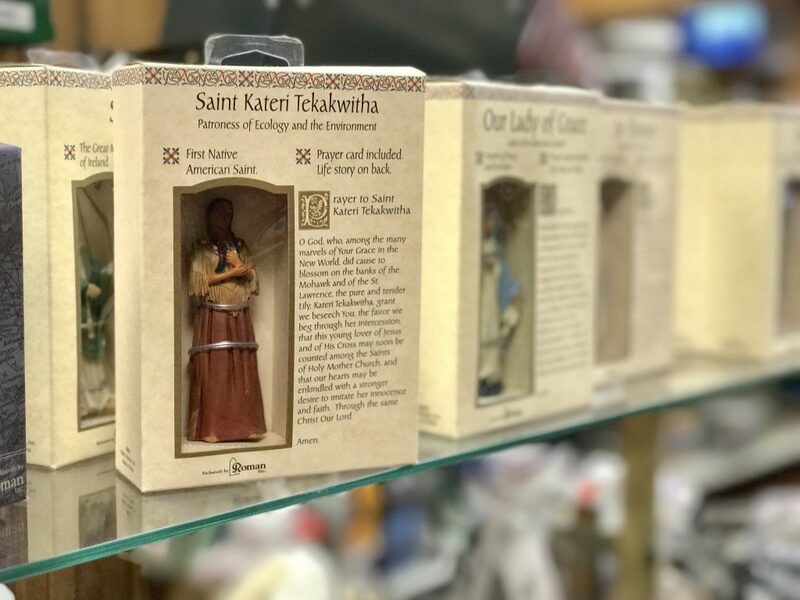 We found a charming Saint Kateri figurine on the shelves there. Saint Kateri Tekakwitha is the patroness of Ecology and the Environment and was the first Native American Saint. Weigant’s Pharmacy has a number of religious figurines. Every year, the Osage County Cattlemen’s Association combines with the Oklahoma Visual Arts Coalition and the Pawhuska Chamber of Commerce to host an evening of fun, wine tasting, and good food to support the arts in Oklahoma. This event is the kick-off to the annual Ben Johnson Memorial Steer Roping competition, also held in Pawhuska. 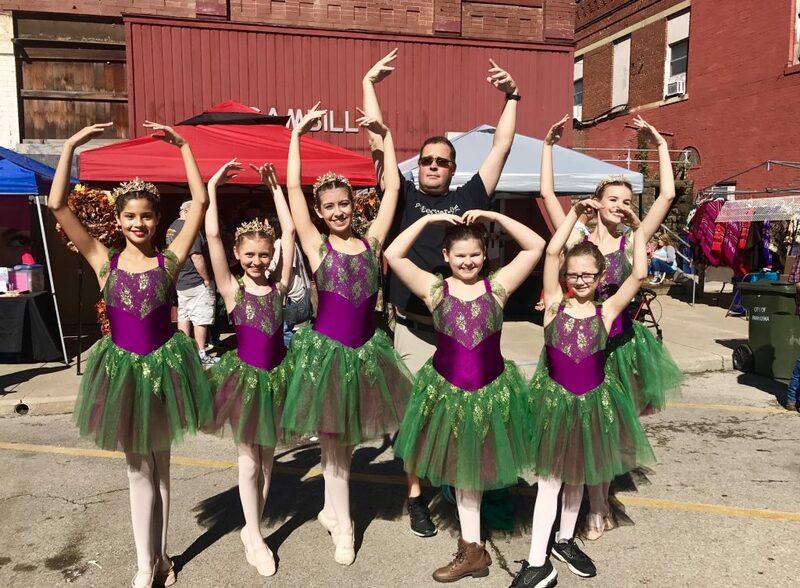 Dance Maker Performing Arts Academy offers opportunities for arts education through ballet, tap, and jazz classes to students of all ages and levels of expertise. They have an annual recital each May and also offer some other special performances throughout the year. Check the Dance Maker website for more information. The Dance Maker Performing Arts Academy says they have classes for all ages and levels of expertise. There might be hope for Steve, after all. Mudpies is a unique home decor and gift boutique with two locations. Each store offers a unique inventory of humorous signs, kitchen towels, home decor items, jewelry, gifts, soaps and deliciously scented candles. And, it seems some of the nicest people in town work there. They have quite a line of men’s soap in Mudpies2. 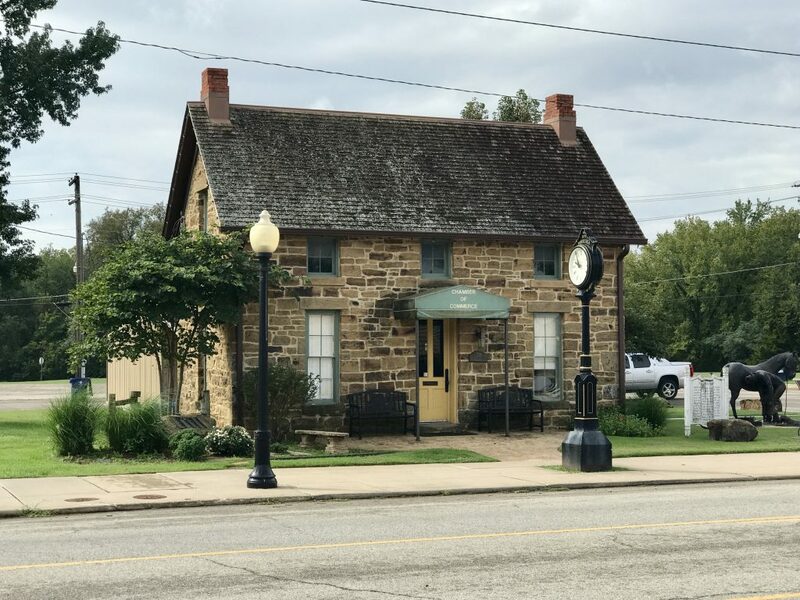 When you’re shopping at the store on West Main, you can also sit a spell on the shaded porch, and relax on the wicker couch used in the filming of August: Osage County. 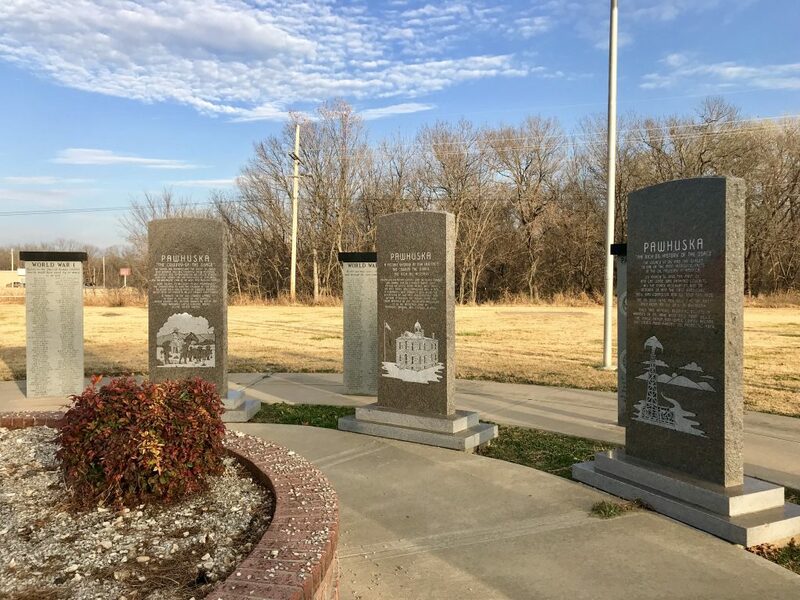 Visit the Pawhuska, Oklahoma Veterans Memorial at the southeast corner of Main Street and Lynn Avenue which pays tribute to local veterans who served. Take a moment to reflect on the sacrifices of those who have given so much for our nation and freedom. The Veterans’ Memorial in Pawhuska. Stay on the trail. No need to bushwack for this one. The cache is now a magnetic key holder. Bring your own pencil! You can approach from the North or the South, but I recommend the North. Parking is within feet of the cache from this direction. If you get seasick, definitely approach from the North! The “Million Dollar Elm” was the place the Osages auctioned off leases for companies to drill for oil in the early 1900’s. Millions of dollars changed hands under this tree, and there was even an occasional fistfight when a patch of ground was seen as super-profitable. While the tree is no longer there, a monument marks the spot that played such an important role in America’s and the Osages’ history. This monument marks the place where the Million Dollar Elm stood. In its shade, millions of dollars worth of oil leases were sold. Head west on Main Street to a small drive-up building near the car wash where you’ll find Sweet-T’s. There you’ll find fantastic burgers and huge portions of incredible fries. Perhaps even better, though, is real homemade ice cream in flavors like Birthday Cake and Brown Butter Walnut. Hours vary depending on the day of the week, so you’ll want to check the Sweet-T’s Facebook page or drive by to see if it’s open. 57. Use the public potty on Kihekah Ave.
We wouldn’t normally include a public loo on our list of things to do, except it’s the best small town public restroom we’ve ever seen. This new facility in the middle of downtown has been shiny clean on each of our visits, and it features beautiful wooden stall walls and doors. Every town should have public restrooms this nice! The public restrooms in Pawhuska are some of the nicest and cleanest we’ve ever seen. 58. Show your team spirit and support the Huskies! If you’re visiting Pawhuska and want to fit in, stop by Spurs & Arrows or other local stores and pick up an orange Pawhuska Huskies t-shirt or hat. Who knows, you may even get looks from locals wondering why they can’t figure out who you are. You can get some local team gear while you’re in town. Each summer for more than 70 years, residents of Pawhuska have come together for Cavalcade, the world’s largest amateur rodeo. For a solid week, the town welcomes bull riders and calf ropers, barrel racers and pole benders, each trying to outdo the others. 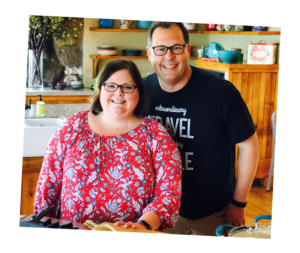 With food vendors and street dances, Pawhuska has a great time. Cavalcade is typically the third week in July. Pawhuska native Gina Gray was one of the most well-known Native American artists of the past 30 years. Her work, incorporating bright, bold colors featuring stylized figures and abstract landscapes can be seen throughout the community. This is just one more reason that the the art scene in Pawhuska is so wonderful. Pawhuska has a Rotary Club, Kiwanis, American Legion, and Lions Club along with other service organizations, and they do many great things in and for the community. Clifton’s Gift Shop on Main Street offers a large selection of Pendleton blankets, Osage regalia, as well as other gift items and Indian art. Be sure to stop in an say hello to the friendly folks who work there. 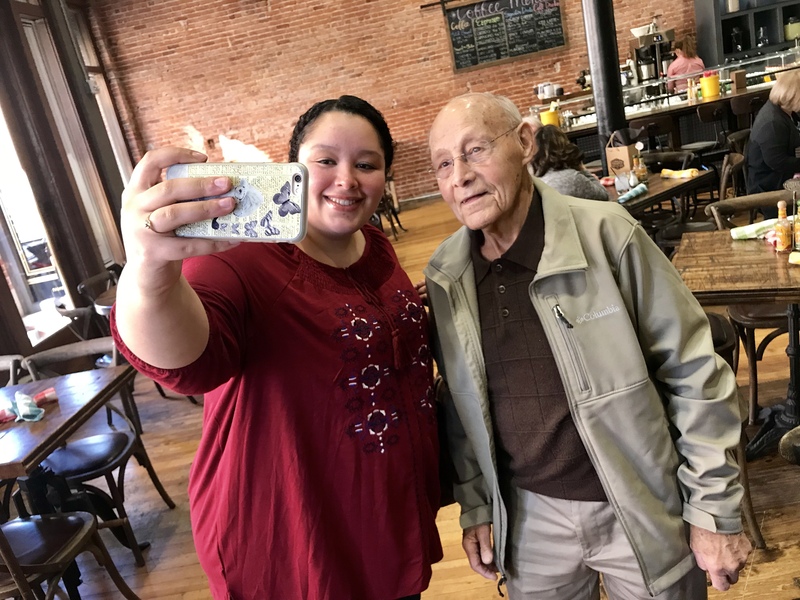 They’re always happy to meet new people and hear all about what brought you to Pawhuska. The Trubmlys are the longtime owners of Clifton’s Gift Shop and are some of the friendliest people in town. 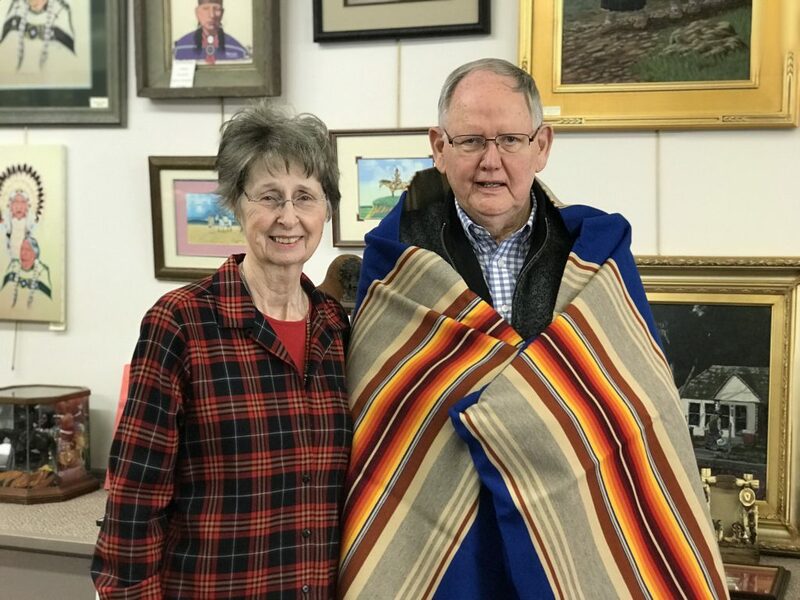 Another place to get blankets is at the Osage Trading Company. 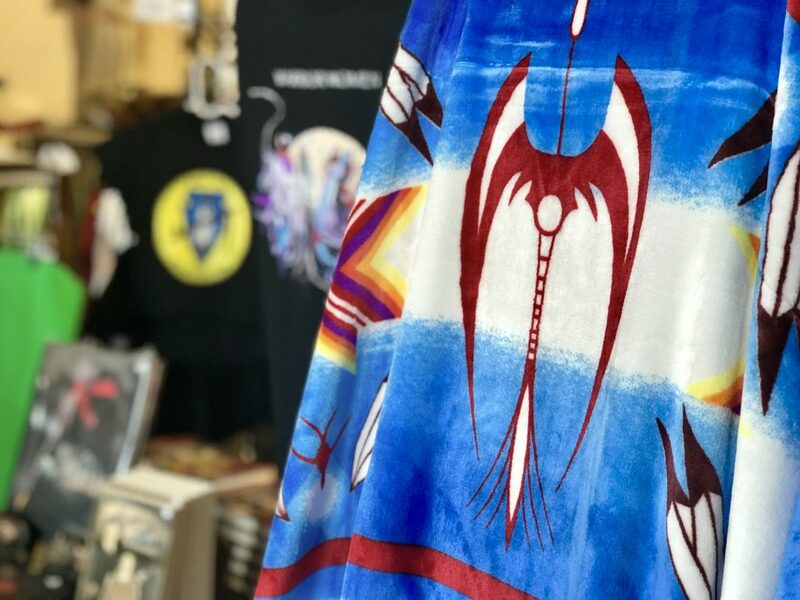 At this old-style trading post, you’ll find everything from silver jewelry and Pendleton blankets to beads, feathers and fringe for traditional Native American dance garments. Named after the Million Dollar Elm where Osage Indians and businessmen gathered to make million-dollar deals for oil rights, The Million Dollar Inn bed and bath overlooks downtown Pawhuska and is just across the street from the former auction site on the Osage Nation campus. The suites at the Million Dollar Inn each have a private bath and kitchenette. The house that is now the bed and bath was originally built in 1912. It was recently saved from certain ruin and was renovated by current owner and Osage Tribal member Cheryl Potts. Each of the four guest suites is equipped with a kitchenette and private bath. Cheryl has decorated with family heirlooms that showcase her unique style and personal flair. 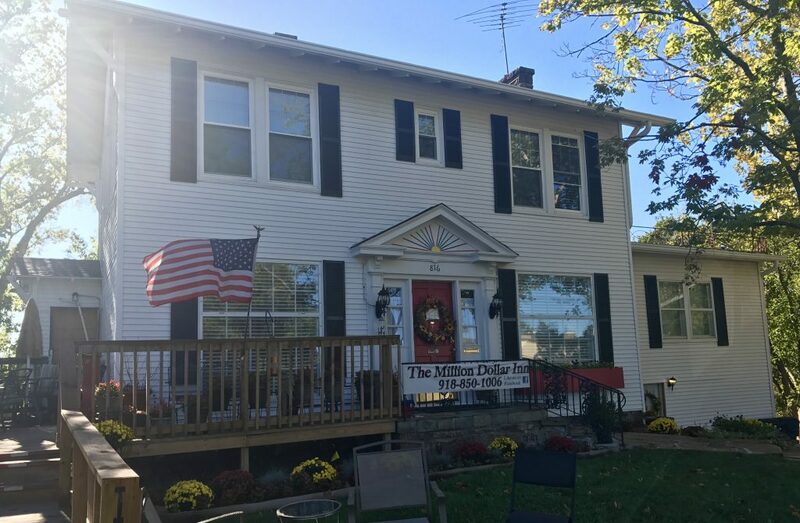 We spent a complimentary night at the Million Dollar Inn and loved the comfortable pillow-top bed as well as Cheryl and her husband’s warm hospitality. It and several other bed and bath properties can be found on Airbnb. 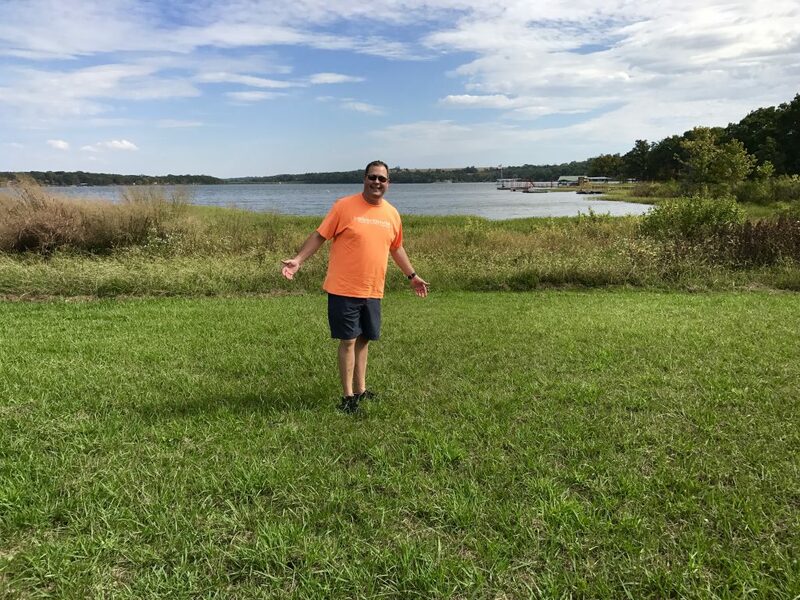 We have also stayed at The Grandview Inn Bed and Breakfast, Redbud Cottage, and the Flamingo’s Nest and can recommend them all. 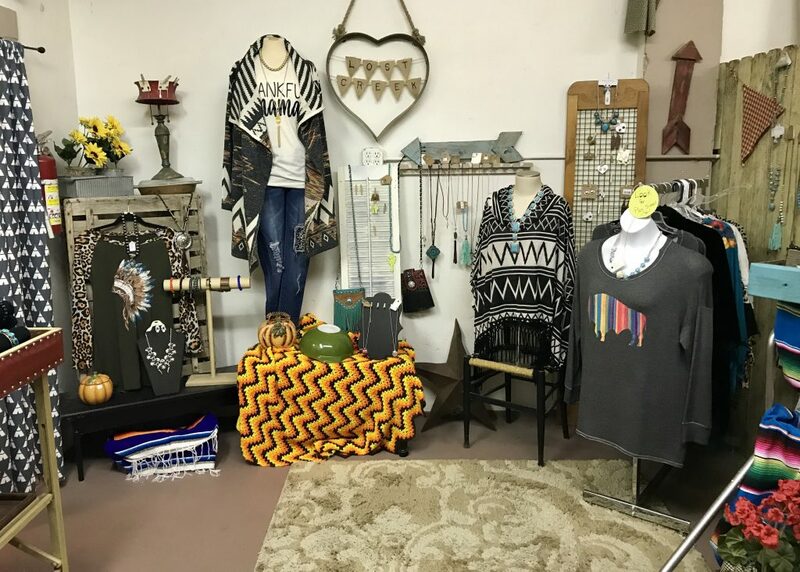 The Water Bird Gallery, located at 134 E. 6th St. in downtown Pawhuska, is a wonderful little store that will help bring some style and color to you and your home. 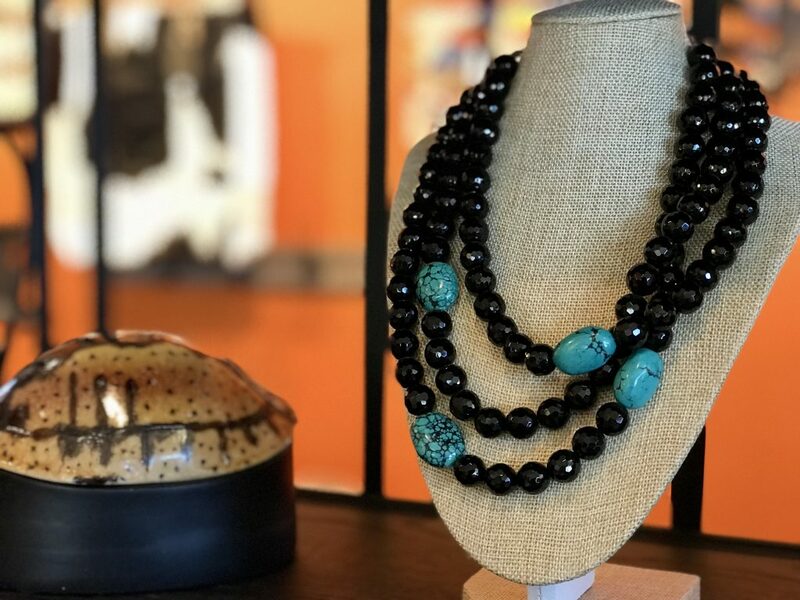 Framed Native American art, turquoise and sterling silver jewelry, vintage and new Native American clothing items, cedar boxes and chests, and macaw beaded fans are just some of the items you’ll find in this friendly shop. 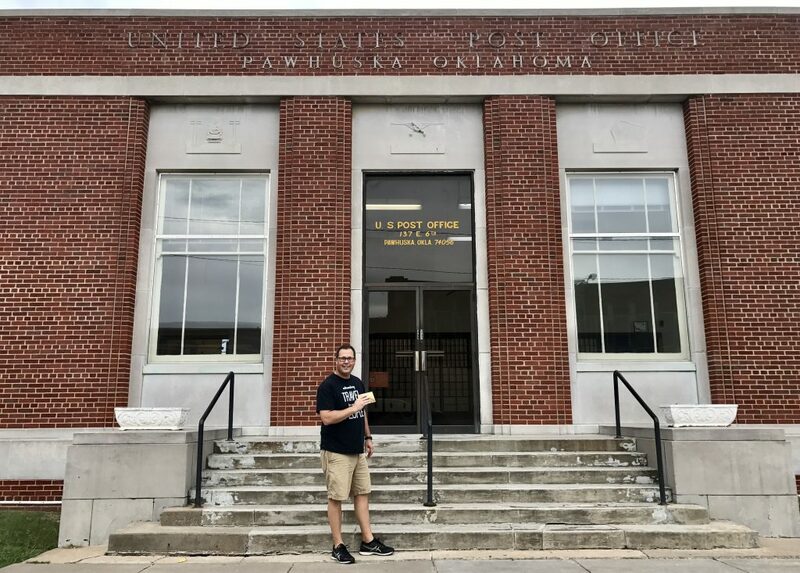 It’s right across the street from the post office so it’s easy to find when you’re sending us a postcard from Pawhuska! 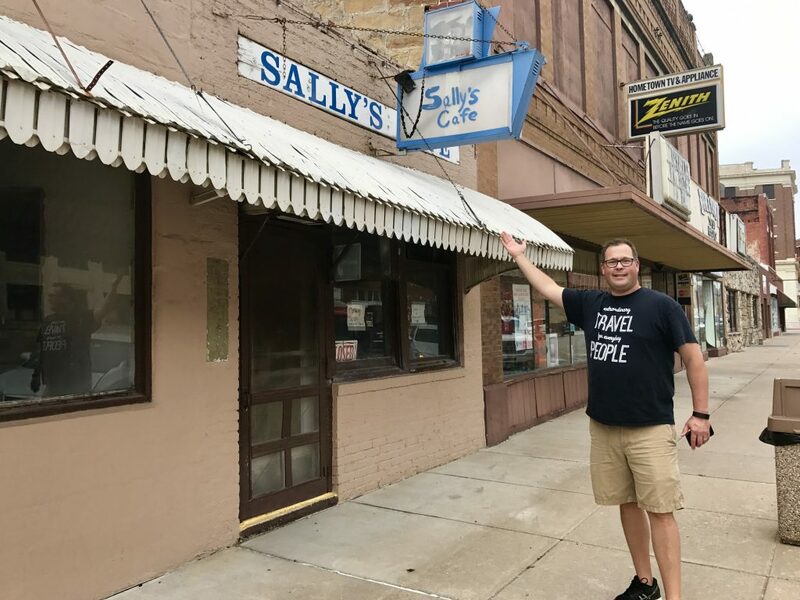 Sally Carroll was a local fixture in Pawhuska and the sign on her cafe is something of a local landmark. She began working in food service when she was just 12 years old and then changed jobs at 14, going to work at a cafe called Lazaro’s. When she was 21, she bought Lazaro’s, and renamed it Sally’s. For the next 77 years, the folks in Pawhuska indulged in her burgers, chili, and pie. She retired at 98 and passed away in early 2017 at age 100, but the sign for her cafe and her memory remain. Historic Sally’s Cafe is closed now, but the sign remains. 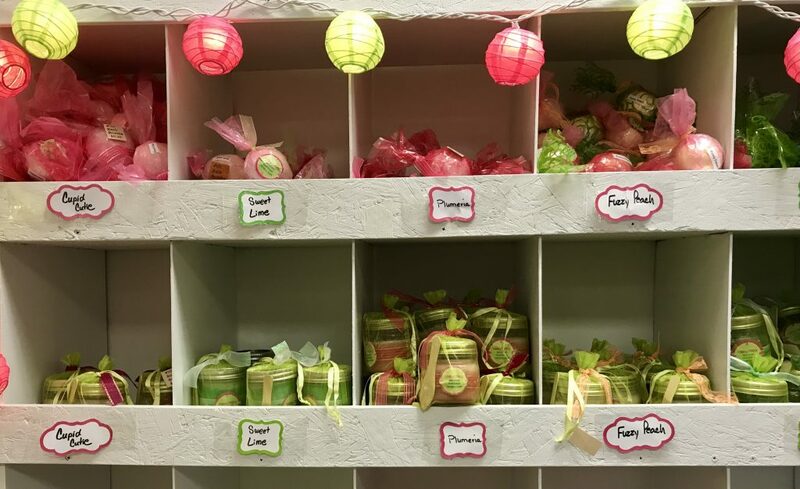 Out on Highway 60 near the Tag Office, you’ll find a little store called The Grape Dumplin’. Inside they offer women’s clothing along with home decor and get this … you can also drop off your dry cleaning there. Ann checks out some of the cool clothing at the Grape Dumplin’. Over on Lynn Ave you’ll find a neat little place that offers great hot dogs with all your favorite toppings like chili, and cheese. Roadhouse Coneys also offers other favorites like walking tacos and Frito pie. In addition, they have a number of TVs, both inside and out, tuned to sports programming so you can take in the game along with some of your favorite comfort foods. 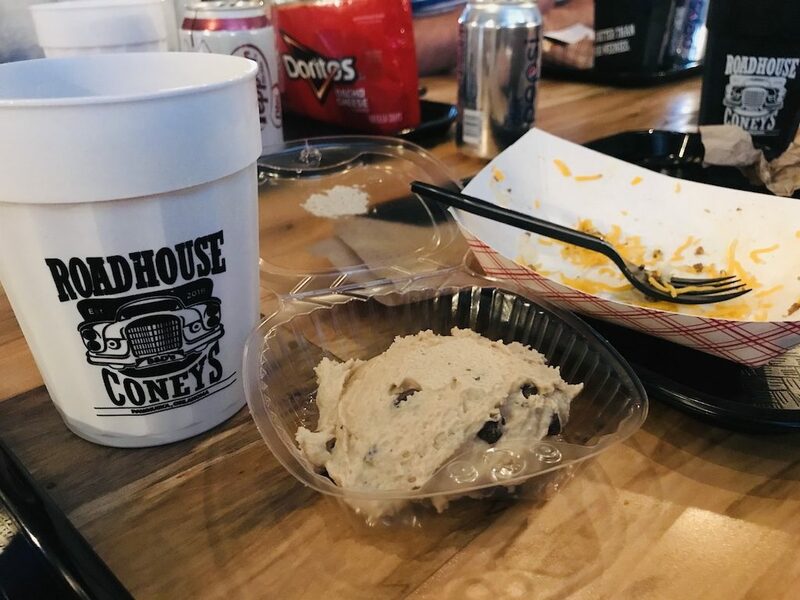 When you go, don’t forget to order a little of their edible cookie dough for dessert. You’re welcome. The coneys were so good that Steve ate them before we could remember to take a picture. The edible cookie dough which we did remember to photograph was also delicious. 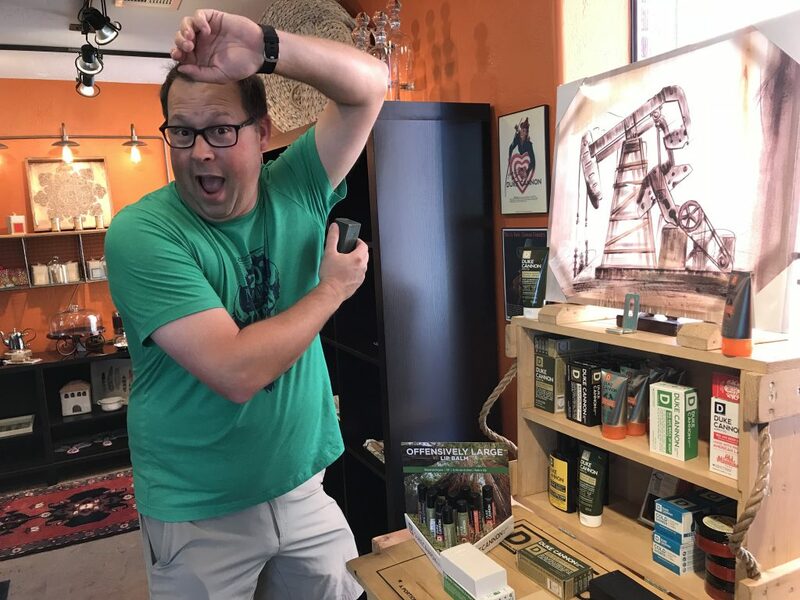 There are a couple reasons to visit the Pawhuska Chamber of Commerce. The first is that Reba Bueno and Joni Nash work there and they are super friendly people who are a wealth of knowledge on the entire area. The second is that the building itself was the first house built in Pawhuska and has quite an interesting history. Reba will tell you all about it if you ask. Stop in the historic chamber office to meet some of the friendliest people around! 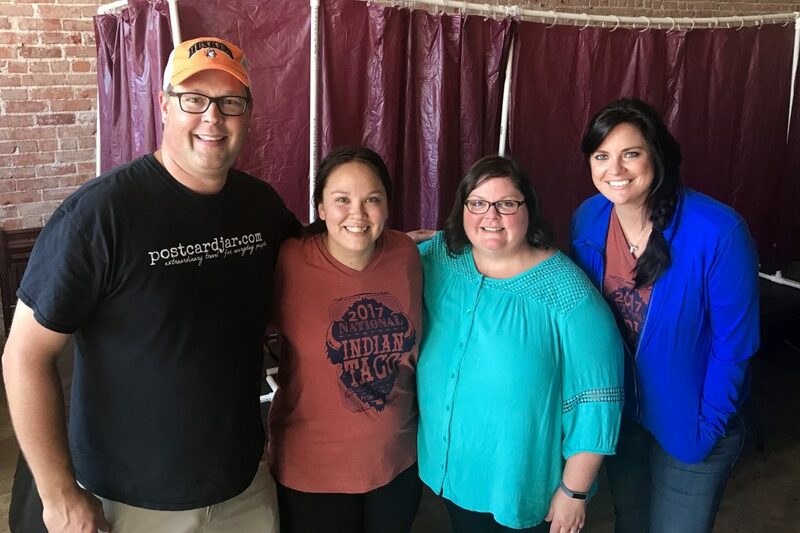 Steve and Ann took a pic with Reba and Joni from the Pawhuska Chamber of Commerce during the National Indian Taco Championships. So, the Buckin’ Flamingo that we mentioned earlier is a pretty cool place. In addition to everything they offer in their store, they can also bring goat roping to your next get-together. Contact them for details and to book this unique entertainment experience. You are on the plains of Oklahoma, one of the places that God set aside for having beautiful sunsets just about every single night. Head out west on Highway 60, find a safe spot to park along a side road, kick back, and take it in. You’ll be glad you did. Want to carry a graf lantz bag like the one Ladd bought Ree on that one episode? You can get it here! Just across from The Mercantile, Pierce Arrow is a great place to shop for fine jewelry, apparel, home decor & gifts. In addition to the beautiful handbags, be sure to check out their beautiful selection of Chili Rose bracelets. 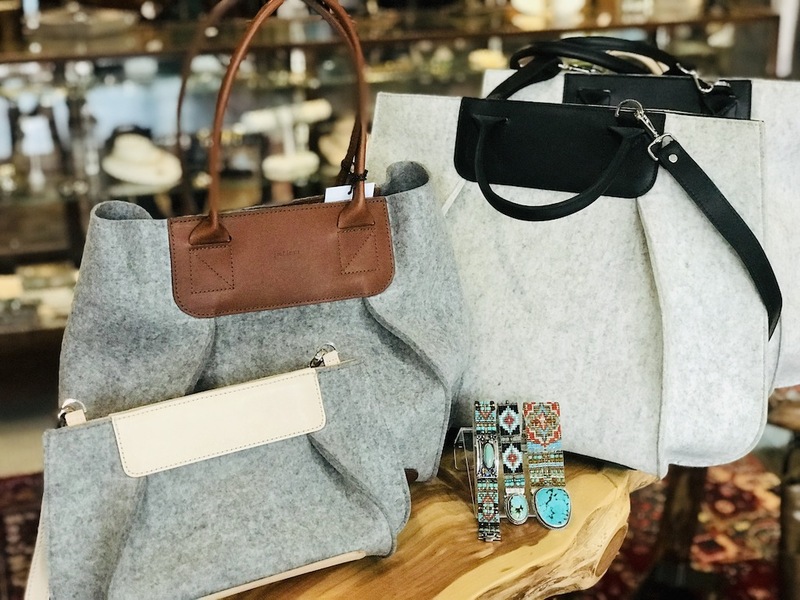 Pierce arrow offers Graf Lantz handbags, Chili Rose bracelets, women’s clothing and other jewelry. The first Tuesday of every month is a big day at the Osage County Fairgrounds Ag building. Cody Garnett from the Buckin’ Flamingo puts on an auction that draws a crowd from far and wide. Starting at 6:01 p.m., he auctions off tons of items including jewelry, coins, treasures, trailers, guns, equipment, furniture, and home decor. Make plans to attend if you’re in town because you may just stumble into the deal of a lifetime. Sister’s Attic is a consignment store located just east of the Merc on Main Street. It is a shop of many mini-shops, each booth with its own flavor and flair. Stop in and find amazing things from new clothing and art to used toasters and books. The owner, Randi, is so friendly that a stop in this store will never be a waste of time. 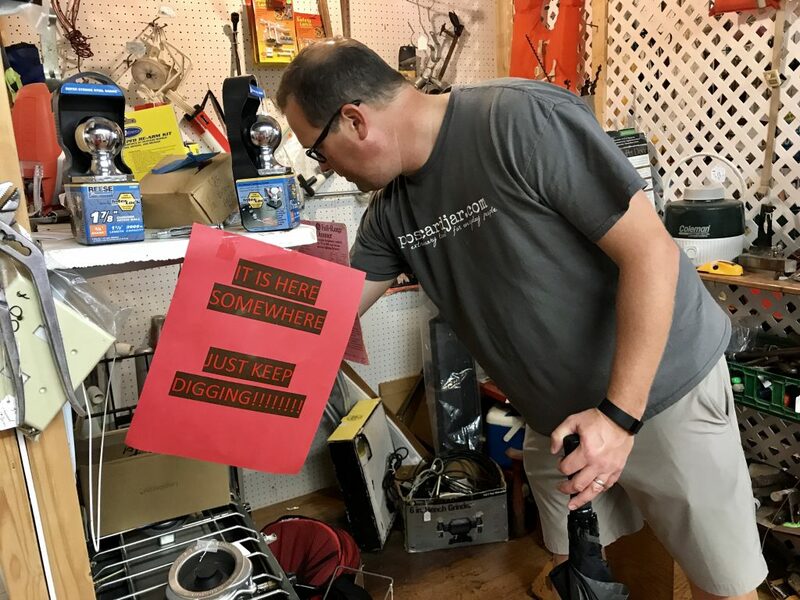 Steve follows the advice of the sign at Sister’s Attic. And the sign is right, they have one of about everything in there. Bad Brad’s BBQ is an amazing little place on the north side of Highway 60. The Frito Pie features a bed of Fritos corn chips topped with cowboy beans and your choice of meat and cheese. Also available is a dish called cowboy fries which is the same thing but with fresh cooked french fries. Both are amazingly delicious. 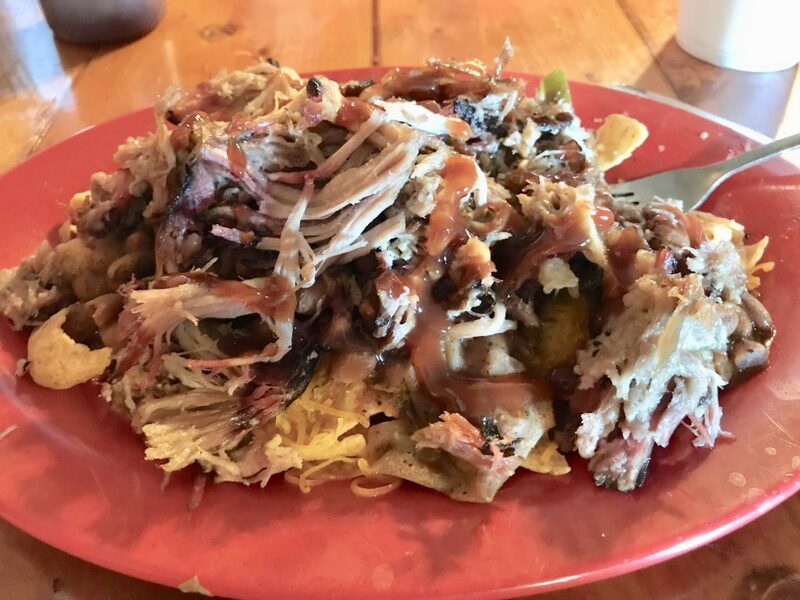 This Frito pie with pulled pork at Bad Brad’s tastes even better than it looks. Locals tell us that the fried bologna is the best meat choice and it must be, as they were completely sold out of it by the time we arrived. Instead, we ordered the pulled pork and the smoked brisket and it was some of the best BBQ we’ve had anywhere. Go hungry, as the portions are hefty. There are quite a few places to stay right in the heart of downtown Pawhuska. The Little Rainsong Loft is a recently renovated space that is 1,100 square feet with two bedrooms that will sleep six people comfortably. It also features a private entrance, kitchen, living room, full bath, dining room, screened-in back porch, and backyard with firepit. Historic Whiting Bed & Bath is another great place to stay. 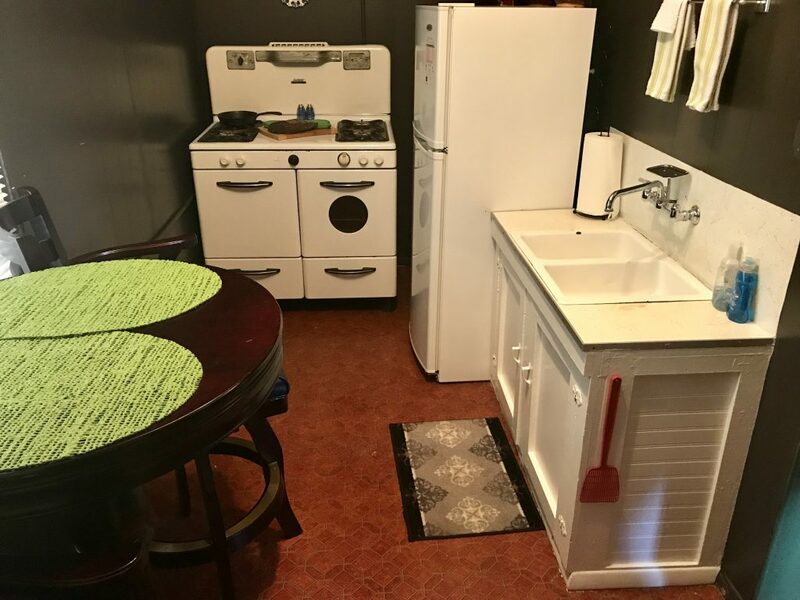 Each of the 12 uniquely themed rooms has a private bathroom, as well as a kitchenette with microwave, coffee pot, toaster, and refrigerator. The kitchen of our room in the historic Whiting Bed and Bath in downtown Pawhuska. 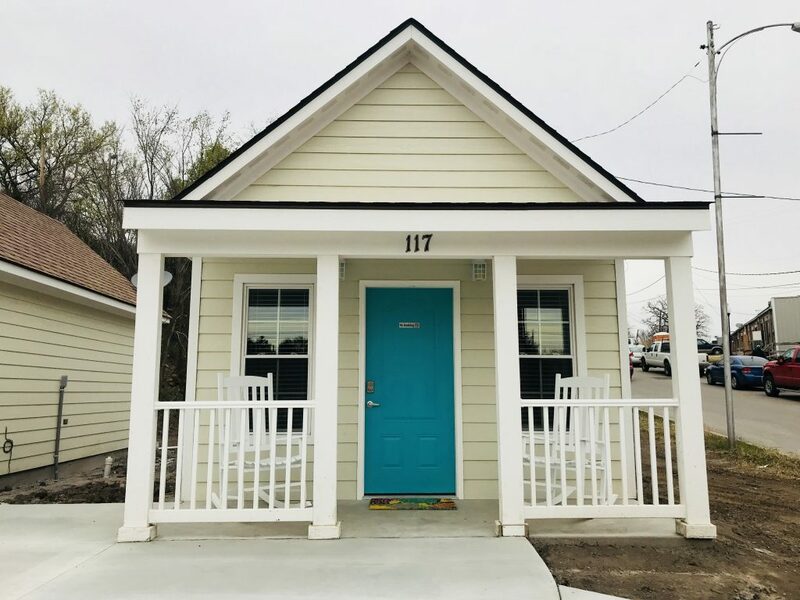 The Prairie Cottages, located next to the Prairie Cottage store, are charming one room cottages located about 100 steps from the Mercantile. One has a king bed, the other has two queens. Both are clean and modern. Finally, the Triangle building recently reopened as the 23-room Frontier Hotel. With all these options, you’re sure to find a comfy place to rest your head. 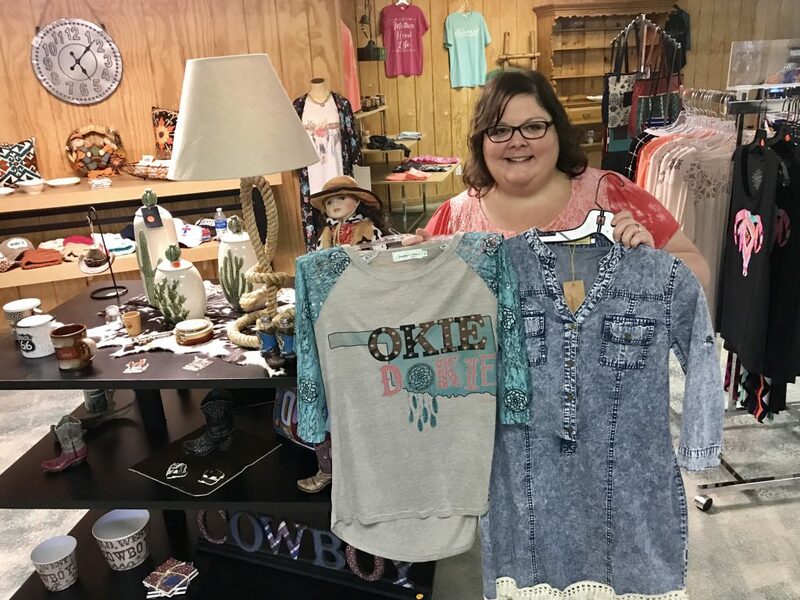 Operated by a delightful woman from Australia, the Gypsy Cowgirl and Gypsy Boutique Mall offers unique collections of women’s clothing, infant and toddler clothing, accessories, home decor, furniture, antiques, and gifts for a variety of styles. They have an adorable line of mommy and me and clothing items for moms who want to match their little ones. The Gypsy Cowgirl has a wide variety of interesting items. 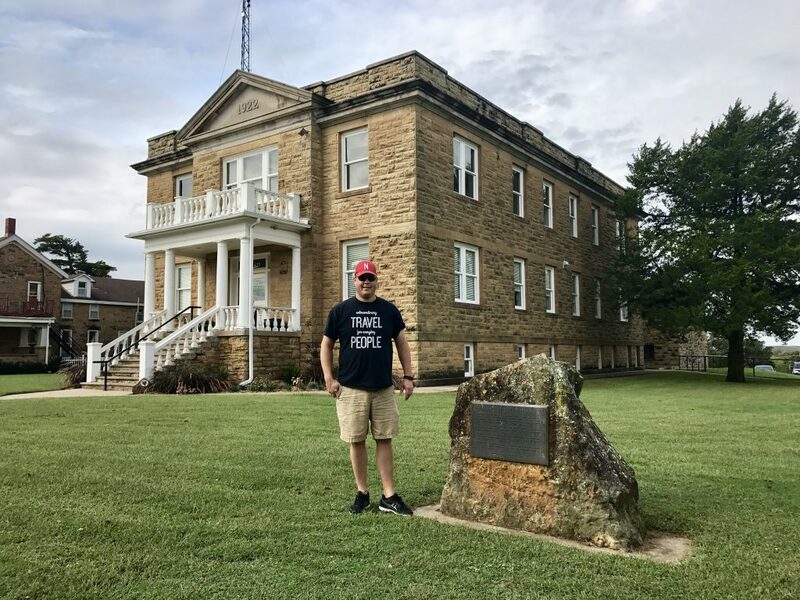 About 20 miles from Pawhuska, you’ll find oilman Frank Phillips’ ranch retreat he called Woolaroc, which is now a museum and wildlife preserve. Pay admission at the gate then drive onto the property where you’ll see bison, as well as some other unique animals like water buffalo, zebras, giraffes, and ostriches. The property also includes a museum with extensive collections of western art and artifacts, Native American material, and according to its website, one of the finest collections of Colt firearms in the world. 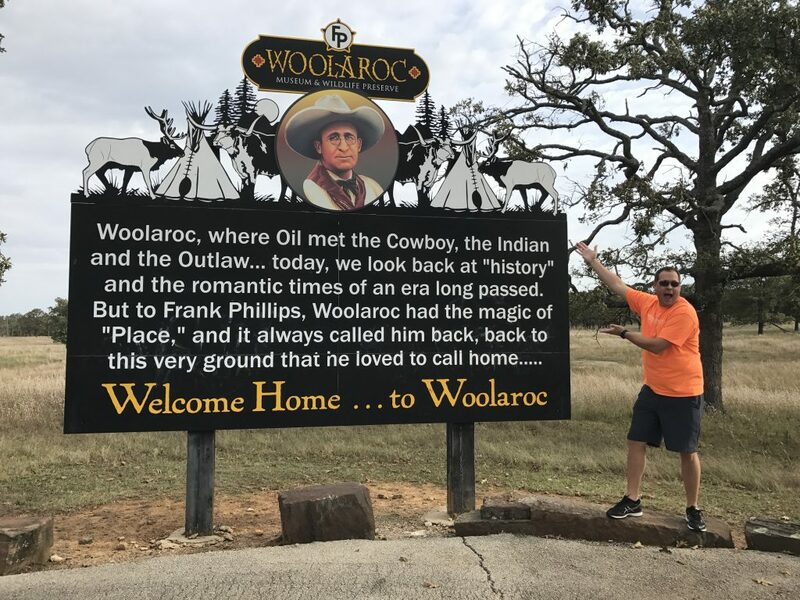 Woolaroc (derived from the words woods, lake and rocks) is open year-round to visitors and a trip to the area would not be complete without a stop at this unique attraction. John G. Reber is one of Pawhuska’s most beloved residents. 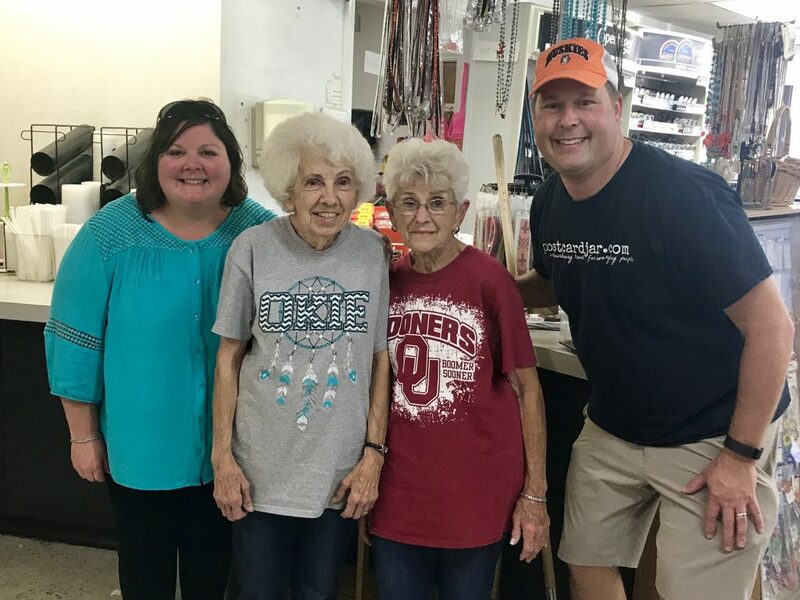 The former band teacher at Pawhuska High School, Mr. Reber is now retired and often has a pancake and coffee in the morning at The Mercantile before going next door to LOREC or across the street to Osage Outfitters to visit with employees and customers there. He loves to meet new people and take selfies. Meghan took a selfie with Mr. Reber after breakfast at the Merc. Because you probably want another one, and the ice is sooo good that you can’t stop crunching, make one last stop at Handy’s during happy hour (10-11 a.m. or 4-5 p.m.) for a half-priced fountain pop. The best part is that by your third stop at the store in the same day, people might begin to mistake you for a local. Ann and Steve pause for a picture with Martha and Margie at Handy’s. We’ll have to check it out and add it to our list. There is a quilt shop in Pawhuska that has been there for 8 years and is ran by an award winning Oklahoma long arm quilter. The name of the shop is The Tangled Thread. Thanks for the information! We will have to check it out the next time we’re in Pawhuska!